Why Aren’t The Anti-Vaxxers Celebrating This? 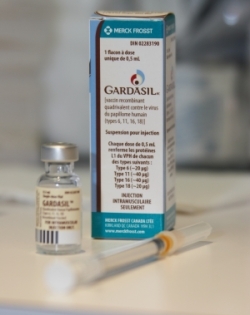 Today the Advisory on Committee on Immunization Practices (ACIP) has advised against the routine use of the HPV vaccine (Gardasil) in boys and men. This should have been met with fireworks, pomp and jubilation in the streets by those who are against vaccines. Afterall, one of their favorite gambits to run is how the whole pharmaceutical, vaccine and medical industry is in cahoots to poison society with their deadly cocktail of vaccines. A major organization has decided that it is not efficacious to distribute the vaccine wholesale through the male population but there is not widespread jubilation through the anti-vax community. Shouldn’t the decleration that an organization this large is breaking from the conspiracy to injure and sterilize us all be a major coup for those wingnuts? Or maybe they know deep down in their hearts that there is science behind the vaccines and if they acknowledge that an advisory committee recommended against widespread use of a vaccine it would throw their whackaloon conspiracy theories out the window. I haven’t looked through much of the evidence to determine the cost-effectiveness but the BMJ article seems to have some pretty sound minds behind it. You sure won’t find the whackaloons touting how a government agency charged with researching the effectiveness of vaccines has determined that this one does not hold a great enough benefit to be widely distributed to males because this destroys their crackpot theories. I bet we do see a bunch of comments circling the “AHIP said this vaccine doesn’t work and doesn’t protect against HPV.” Of course that’s not at all what the decleration or science on the vaccine says, but things like facts and sound judgements aren’t usually a tool used by these people.